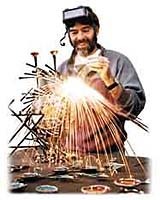 Gary Rosenthal has been sculpting in welded metals for over 25 years. Each creation from the collection is crafted in copper, brass or steel, carefully shaped and finished by hand. Vibrant colors, formed by the natural oxidation of copper, are created by carefully controlling heating or cooling. Please contact Tideline Gallery to determine availability of Gary Rosenthal's items. We will be happy to let you know what we have in stock and what can be ordered in time for your special occasion.